A smaller, expanded line of Nu Restaurants is making its way to Vancouver. 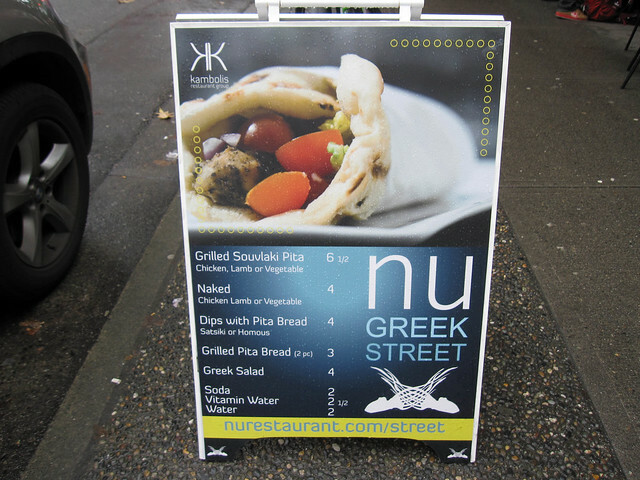 Nu Greek on Robson Street opened its doors little less than a month ago. It’s located smack dab in Robson’s new “East of Granville Street” prime casual dining real estate block, between Seymour and Richards. 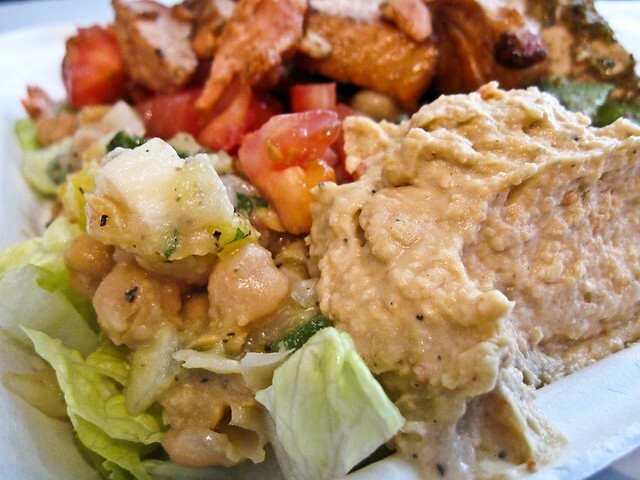 Nu Greek is comfortably nestled between Beard Papa’s cream puffs and Japadog Restaurant. 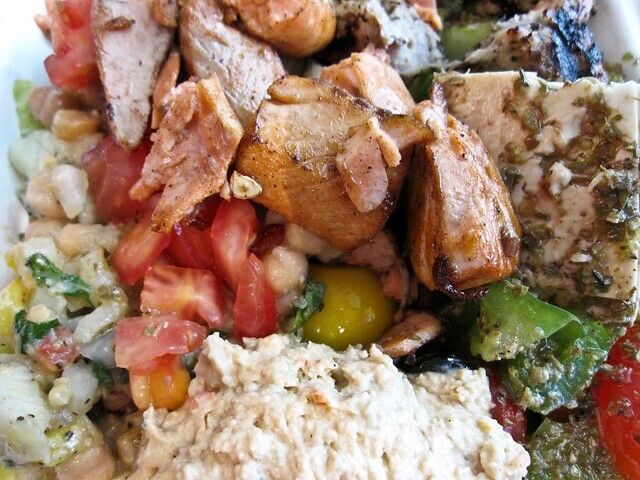 Earlier this summer, restaurateur Harry Kambolis opened two food carts downtown, bringing souvlaki to thousands. 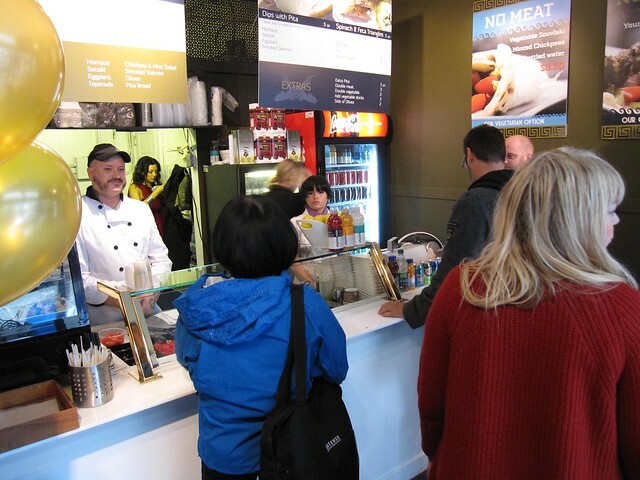 Between the new Robson location and a soon-to-open Broadway near Granville shop (formerly occupied by Michi Sushi), Nu’s smaller shops offer a souped-up version of what’s available at Nu Greek’s food carts, with the conveniences of both a larger kitchen and a roof above its head. I went to check out the latest incarnation this week during their open house. Both Harry and his mother Georgia were in attendance, with a belly dancer enticing customers through the decorative door. Having only lived in Vancouver for six years, I hadn’t been aware of The Souvlaki Place on Denman Street, owned by Kambolis’ uncle. 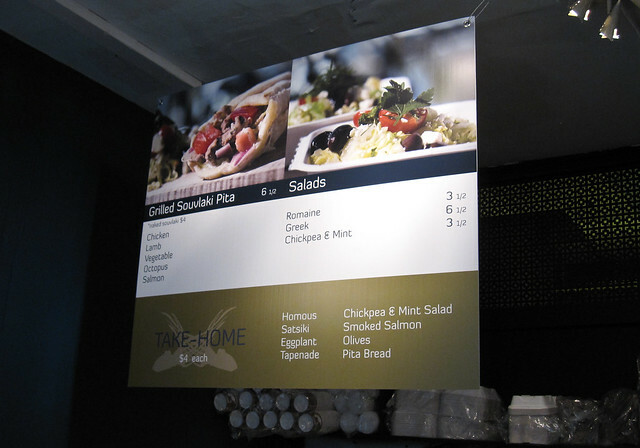 A fixture of English Bay for 21 years, the shop closed in 2005, but not before Kambolis got the chance to work at his uncle’s grill, dreaming one day of franchising the eatery. As he likes to put it, “fine dining got in the way”, and ironically enough, he went on to open Raincity Grill one door down in 1992. He sees Nu Greek Robson as an homage to his uncle. 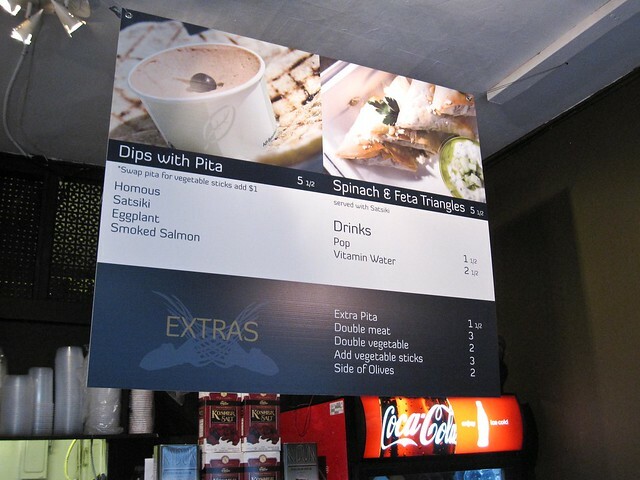 On offer is a range of souvlaki, salads, veggie sticks, dips, and other Greek dishes. The ingredients are sourced from local farmers and producers that the restaurant staff has come to know on a first-name basis. When I visited, I sampled a few souvlakis, minted chick peas, and Greek salad, served with large thin slices of herbed Feta cheese. Warm pita bread and a bottle of mineral water completed the picture. 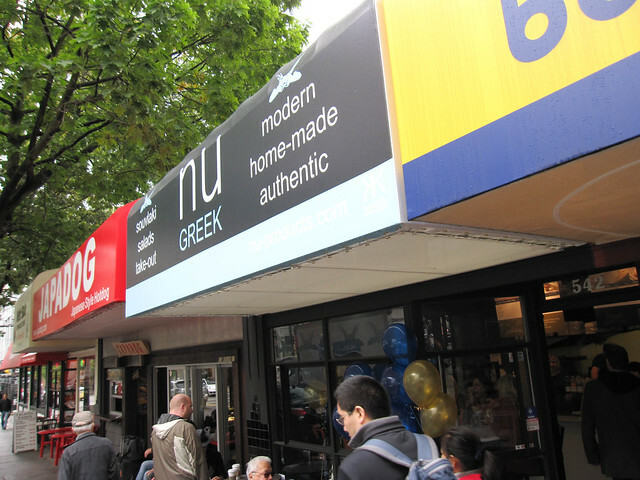 Nu Greek Robson is located at 542 Robson Street in Vancouver. Open daily at 11 am, closed on Sunday (though I’ve been told that there are future plans to open on Sundays as well). I heard that as well! I do know they’ve got a small space on Broadway and Granville near Bob Likes Thai Food. I’ve yet to visit that spot though.